Lock in a great price for La Petite Auberge de Saint-Sernin – rated 8.2 by recent guests! The rooms are clean are very well equipped for a hostel, the room had a private bathroom, kitchen, fridge, microwave, cups and utensils (like a corkscrew). Fantastic. 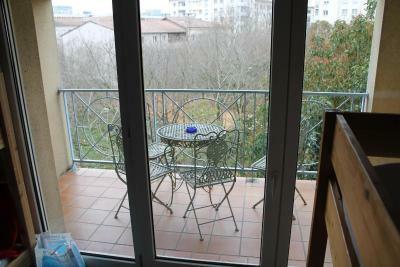 The location is near the towncenter and the whole environment is nice and friendly. 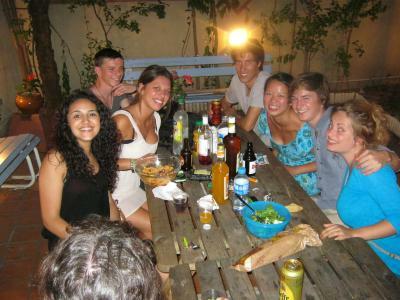 I wish there were more hostels like this! Great hostel! Did not have too much interaction with staff but the receptionist seemed sweet. All rooms are equipped with a kitchenette which is a good addition if you wake up at the same time with your dorm mates. The room was like a studio apartment with a kitchenette and refrigerator. The private patio was a lovely place to sip a glass of wine. A lot of things inside: a microwave, a kettle, many chairs, a coffee machine. Two shower rooms and a separate toilet room. Free padlock. I liked this "help yourself" 1€ breakfast :D Also the hostel is quiet and warm. The location is great. Besides the location, I liked that the appliances were in the room (microwave, water warmer, toaster, burners, fridge, coffee maker, sink...) They also had a table and chairs in the room. 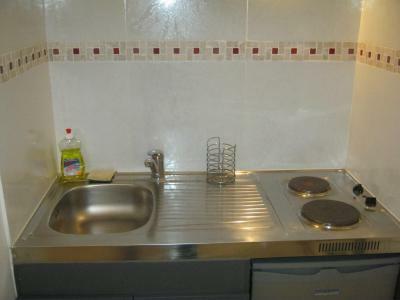 Great location, close to city center, clean room and the kitchen inside the room is well equipped, microwave, fridge, kettle and toaster are all available. very nice to have a heater it really helped a lot when I stayed during the cold snap. The ambience is very nice! Met some really cool solo travelers with interesting conversation. Good value and great stay overall! Thought the space was very clean, really enjoyed having a bathroom for each room (at least my room), found the beds comfortable, found the common space and the staff friendly, and enjoyed my breakfast. Great location for walking around Toulouse, which is one of my favorite cities in France. Juliana is very friendly and helpful. Also, even if I did not book for a female dorm, they granted my request and put me in all-female dorm. I also like how close the place is to the next supermarket and city center. 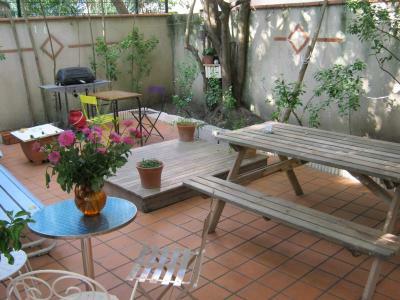 It is great value for your money in Toulouse! There are kitchen facilities in every room and a great garden for socializing! The vibes are really nice and it's easy to meet other people! I know my negatives review is long but that's just because it involves a story about one thing I didn't like...I really would recommend staying here! 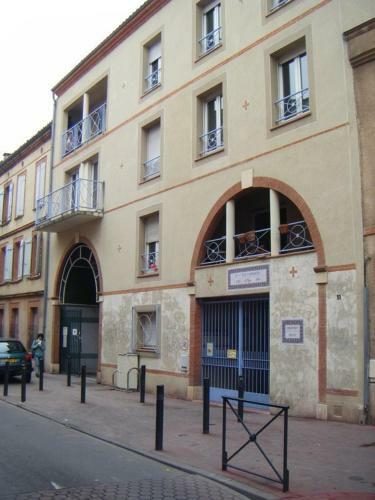 Free Wi-Fi is available at this hostel with self-catering facilities, located in the historic center of Toulouse. 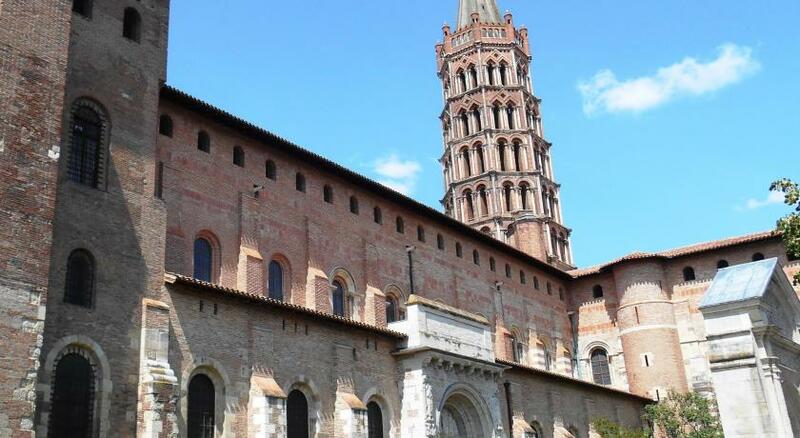 It is 500 feet from the Basilique Saint Sernin, the oldest Roman basilica in the world, and 2.8 mi from Toulouse Stadium. 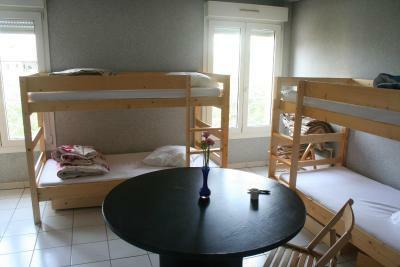 La Petite Auberge de Saint-Sernin’s room has a view of the public park and is in the style of a youth hostel. After a day of sightseeing guests are welcome to relax on the patio. Guests can prepare meals in the kitchenette, which includes 2 electric hot plates and a refrigerator. There is also a free luggage storage facility. 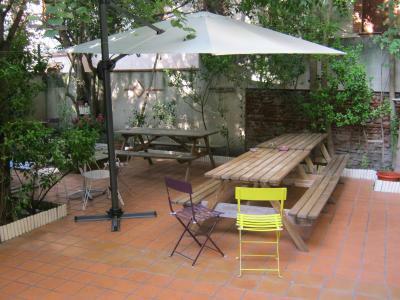 Place du Capitole is 2,300 feet from the hostel, which is 10 minutes by subway from Toulouse-Matabiau Train Station. 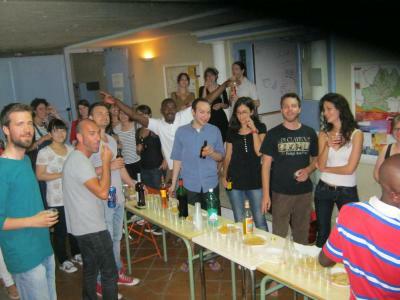 The hostel is a 5-minute walk from Compans-Caffarelli Metro Station, where there is a shuttle to Toulouse-Blagnac Airport. 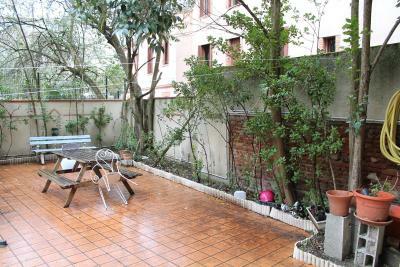 뀐 Located in the real heart of Toulouse, this property has an excellent location score of 8.6! 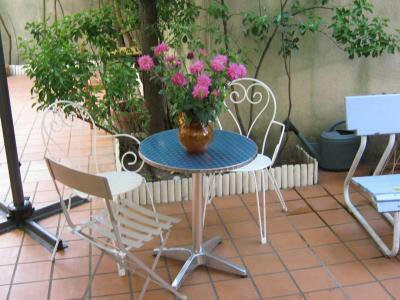 When would you like to stay at La Petite Auberge de Saint-Sernin? 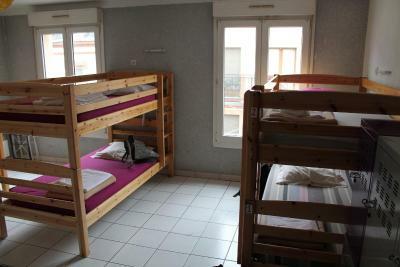 This is one bed in a 4-bed dormitory featuring a kitchenette with 2 electric hot plates and access to a shared bathroom. 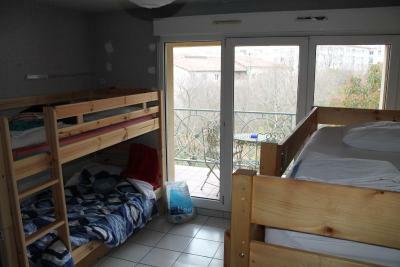 This is one bed in a 6-bed dormitory featuring a kitchenette with 2 electric hot plates and access to a shared bathroom. House Rules La Petite Auberge de Saint-Sernin takes special requests – add in the next step! La Petite Auberge de Saint-Sernin accepts these cards and reserves the right to temporarily hold an amount prior to arrival. Please note the reception hours: 10:00 to 12:30, 14:30 to 19:00, and 19:30 to 21:00. Guests expecting to arrive after 21:00, are requested to contact the property in advance to obtain the necessary access codes. Contact details can be found on the booking confirmation. Guests are required to show a photo identification and credit card with matching names upon check-in. Please note that all Special Requests are subject to availability and additional charges may apply. Please inform La Petite Auberge de Saint-Sernin of your expected arrival time in advance. You can use the Special Requests box when booking, or contact the property directly using the contact details in your confirmation. The area where the hostel is located seemed dodgy, some French guys started stalking me around the area in the daytime as I left the hostel. I would advice to not leave the hostel on your own at night time if you are a girl. 28€ is too much for this kind of accommodation. The towels were a bit scratchy. There wasn’t really anything I didn’t like. 4 person dorm was like a small apartment. It was easy to arrive here after the reception had closed. Location was excellent with a walking distance to downtown. I had a super nice stay! Surprisingly also breakfast was offered for a little extra price, which was a nice start for the day. 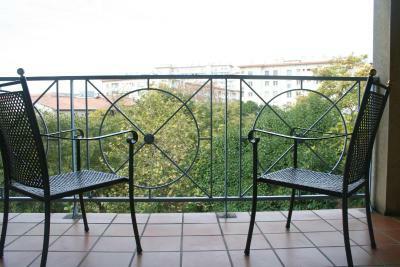 The kitchen is conveniently placed in each room, it is well located, and a quiet place. The reception is not 24 hours so if you need something at random times (like a towel for example) you won't have help. The shower of my bedroom was not working, so i had to go to another floor to have a shower. The light of my bed was not even there, so i had no lights. It was an expensive hostel to not have this kind of things. If you do cook, the smells are right in everyone else's face. The price is a little more expensive than hostels in other cities especially for such simple quarters, but it's one of the only few in the area. Balconies in the rooms, nice to eat and have tea on. Own kitchen and fridge in rooms as well. Piano downstairs! Roomy bathroom and nice showers.